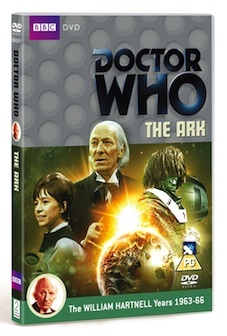 Since the preview DVDs and press releases have gone out, I can now tell you about my small part in the forthcoming BBC DVD release of the 1966 Doctor Who story The Ark. A while ago, I went down to a recording studio in Kentish Town, where m’colleague Simon Guerrier and his brother Tom pointed a camera at me and asked me questions about the influence of H.G. Wells on Doctor Who – an influence especially relevant to this story. At this stage, I can’t remember the details of what I said – and nor have I seen the final cut of the documentary Simon and Tom produced, which appears on the DVD. (All I remember, in fact, is that the recording studio was filled with extremely nice guitars, which I had to restrain myself mightily from playing around with.) However, I do know that the documentary also features such luminaries as Kim Newman, Dominic Sandbrook, Tony Keen, and Matthew Sweet. The DVD is out on February 14th, and can be pre-ordered from amazon here. ~ by grahamsleight on January 8, 2011. My copy arrived today. I’ve skipped through and looked at my bits, but not watched the whole documentary yet.